Wilco just announced a string of North American tour dates for this fall, and St. Louis has one of them: October 4th at the Peabody Opera House. 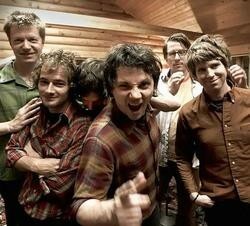 You can see the announcement on the band's official Facebook page, but it's not on the Peabody site yet, and Wilco's own site is down at the moment, perhaps because the tour announcement came with some details on the new album and one jillion people are rushing to find more information. It's called The Whole Love and it comes out on September 27th.